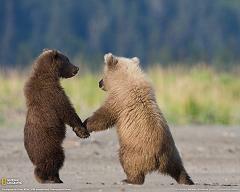 Bears are mammals of the Ursidae family, and can be found in North America, South America, Europe, and Asia. Bears are usually solitary animals and diurnal, meaning they are active during the day and sleep at night. The English name “bear” comes from Old English word “bera”, which means “brown” in Germanic languages. The ancient Scandinavian name for bear is “björn” or “bjørn”, is also a common male name, and has been found mentioned in several runestone inscriptions. In Germanic culture, the bear was a symbol of the warrior, and the Russian word for bear, “Medved”, or “медведь” are common last names. In Russian and other Slavic languages, the word for bear, “Medved” (медведь), and variants or derivatives such as Medvedev are common surnames. The Hebrew word for “bear”, “Dov” (דב), is also a common first name for men in that country. The Irish family name “McMahon” means “Son of Bear” in Irish. Bear names are popular among American tribes, and “Ten Bears” was a famous Comanche chief. “Ten Bears” (Paruasemana) was the name of a well-known 19th Century chieftain among the Comanche. Also among other Native American tribes, bear-related names are attested. Sometimes when you wake up one day and discover you’ve been living with a bear, it becomes clear that these things just won’t work out, and it’s time to separate. The bear’s courtship period is very short, and they usually live together for about a month and then go their separate ways. Bear cubs are born toothless, blind, and bald. As the cubs grow, they will learn to hunt with the mother, and stay with her for about 3 years. Bears reach sexual maturity in 5 to 7 years and the life cycle continues. Can the polar bear mate with the brown bear to produce mixed baby bears? What is the Biggest Bear in the World, Where Does it Live, and Are Grizzly Bears the Biggest Bear?